Ireland manager Mick McCarthy at the Victoria Stadium. MICK MCCARTHY WAS content with three points and the first win of his second tenure in charge of the national team against Gibraltar, but acknowledged that his side’s performance must improve. Jeff Hendrick’s second international goal was the difference at a windy Victoria Stadium on Saturday on a frustrating evening for football in which Ireland had to bide their time to find a breakthrough. Gale force winds and a plastic astro turf pitch affected play, with Ireland failing to match the high-scoring 4-0 and 7-0 wins against Gibraltar which were achieved four years ago. “Listen, we were never going to complain about the pitch,” McCarthy reflected. “It doesn’t make it any easier, the wind’s blowing a gale, but we’ve not played particularly well. “We had some chances and we could have been one or two up in the first half. Darren Randolph was probably man-of-the-match with the save he made — he kept us at 0-0. The 60-year-old praised the performance of David McGoldrick on Saturday. 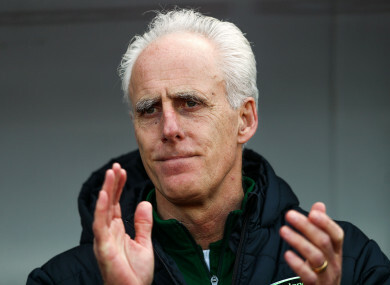 The Sheffield United striker, who worked under McCarthy at Ipswich Town in recent years, earned his first competitive start for Ireland against Gibraltar. “Didsy, as he’s affectionately known, I think he’s played very well to be honest,” added McCarthy. “He’s brought a bit of quality when we needed it. Ireland now turn their attention to facing Georgia, who lost 2-0 to Switzerland tonight, on Tuesday at the Aviva Stadium, looking to take maximum points from their opening Euro 2020 qualifiers. “They’ll be watching that and thinking we’re hopeless,” McCarthy replied when asked about the threat posed by Georgia. “But we’ll play better than that. “I’ll be looking at it [tonight's performance] tomorrow morning and we’ll pick the bones out of it. It’s going to be a completely different game, of course, because they’re a completely different team. Email “'I pretty much hated every minute of that': McCarthy content with three points despite difficult night”. Feedback on “'I pretty much hated every minute of that': McCarthy content with three points despite difficult night”.